Chapter 6: Objective skin performance evaluation: How mild are APGs to the skin? The on-going ‘green’ trend in the personal care industry coupled with global environmental concerns, place natural-origin, biodegradable and skin-friendly surfactants such as alkyl polyglucosides (APGs) in high demand. After successful use in cosmetics, sufficient data has been obtained to welcome some sugar emulsifiers into the field of drug dosage. Alkyl Polyglucosides presents a comprehensive compendium which guides a researcher from the APG-related preformulation stages to formulation processing, including the investigation of various APG-stabilized systems skin performance. 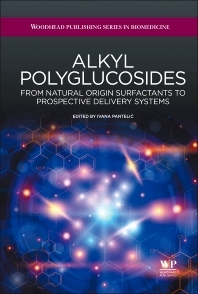 This book introduces various APG representatives, their benefits in relation to certain conventional surfactants, physicochemical and interfacial properties, possible interaction with commonly used ingredients and diverse characterization techniques indispensable for the assessment of colloidal systems. The first chapter introduces alkyl polyglucosides, followed by chapters on their properties, behaviour, an overview of the patent protection mechanisms and guidelines for submitting patent applications. Finally, a conclusion surveys international patent applications involving APGs. Ivana Pantelic is currently a Teaching and Research Assistant at the Department of Pharmaceutical Technology and Cosmetology at the Faculty of Pharmacy, University of Belgrade in Serbia. She is an active researcher on various colloidal systems as prospective carriers of active pharmaceutical and cosmetic ingredients, especially regarding in vitro/in vivo characterization techniques for skin performance assessment.